This exercise will show you how to use GCD to build a spatially variable error model using fuzzy inference systems. 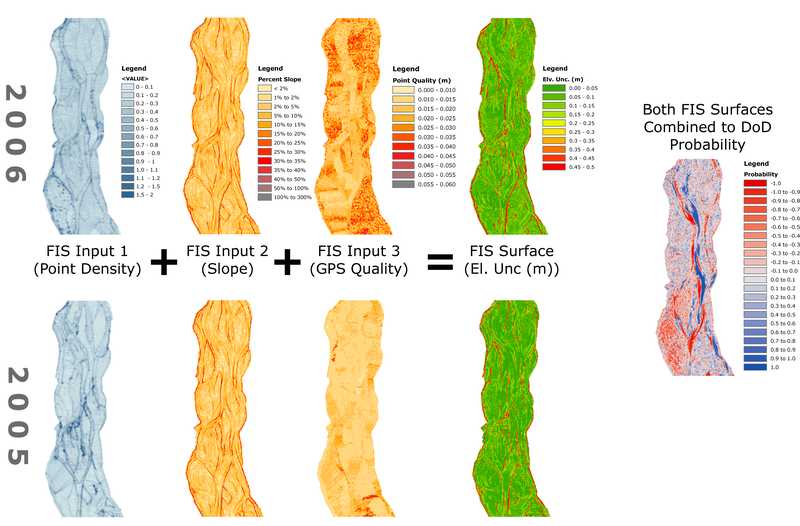 Before we dive into the details of what an FIS is, how they work and how to build your own, we will simply treat an FIS as a black box that takes spatially variable inputs we can model and think relate to surface error, and it will spit out an FIS error surface. This is a powerful and flexible technique for modelling spatially variable error as illustrated below. Figure illustrating independent estimate of spatially variable error for two surveys from Wheaton et al. (2010). 6. Compare results with a Change Detection between same DEM when both are using a spatially uniform error model.